The Broken Bolt Extraction Kit makes removing a broken bolt from a cylinder head much quicker and allows you to salvage the original hole threads. The tool allows you to drill out the exact center of the bolt and after the bolt is drilled out, the bolt threads are removed in a “spring-like” shape. A more detailed explanation can be found on our Demo Small Kits page with pictures to help you visualize how this broken bolt tool works. Grind off any existing part of the bolt above the surface that you will be drilling on. Line up the tool with the hole and use the larger size bushings and work your way down the sizes to hone in on the exact dead center of the bolt and then secure the tool via other bolt holes or C-clamps. 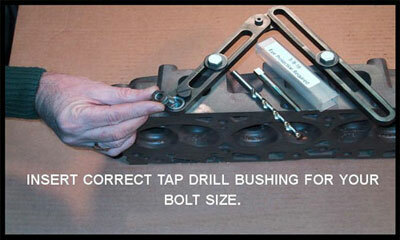 Then go to the took kit and use the correct tap drill (+.005 larger) in the hand drill. This will guarantee that the threads will be separated from the bolt that is being drilled out. Drill out the bolt. Use cutting fluid whenever possible. Continue drilling the bolt until you break through the bottom of the bolt. You will be able to tell when the drill breaks through the bottom by a small sudden drop by the drill. Remove the drill and remove the broken bolt tool so that you may remove the “spring-like” remaining bolt threads in the hole. You may have to use the hand tap to remove some of the excess pieces of the threads. Then blow air into the hole to remove the remaining thread fragments. The ability to drill down the exact center of the bolt allows you to remove the need for EZ-outs, heli-coils or having to take your part to the machine shop to have the broken bolt removed. Many shops have started to adopt this tool and once they have it, it continues to pay for itself time after time. This process of removing a broken bolt from a cylinder head can save you hours of frustration and money. If broken bolts in a cylinder head is a problem that you run across often, this tool will be welcome addition to your tool box.